Roger Corman is one of the great independent film producers. According to IMDB he has 384 films credits as producer between 1954 and 2008. Yes, that’s seven films a year for 54 years! Anyone who’s ever made a film would never be able to comprehend such a acccomlishmeny. What’s even more remarkable is that, it’s been said that Mr. Corman has “never lost a dime”. Corman officially retired himself from directing in 1971, but before that he directed dozens of classic horror and b-exploitation movies. One of his best is “X”, or “The Man With X-Ray Eyes”. 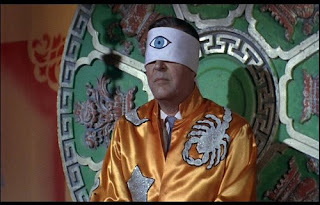 Ray Milland plays James Xavier a doctor who’s on the brink of discovering a way for regular human eyes wave length other than traditional the light waves. When an opportunity arises to present his findings to grant funders, he decides to test his eye drops for the first time on himself. He discovers an ability to see through different layers of matter – including the human body. His world is thrown upside down when he accidentally kills someone, which forces him to flee and go into hiding. On his journey he uses new skills to become a miracle healer, a carnival mindreader, and a Las Vegas gambler. Corman scares the bejeses out of us with a climatic reveal when he uncovers his tainted eyes. The X-Ray special effects provides some interesting psychedelic visuals. When Xavier discovers he can see everyone as naked if he wants to, it provides a classic swinging-60’s sequence in a dance hall. And in Vegas we see from Xavier’s point of view the skeletal figures of people walking around, which creates a surreal melange of colours and horrific imagery. As the movie played on DVD, my wife, as always, was casually watching as she was surfing the internet. She didn’t see the beginning of the movie and didn’t know what I was watching. Though I knew she didn’t know what movie it was, as a fun experiment, I casually asked her if she could guess the title. And yes, she got it right! B-Movies have never felt the need to be coy with their titles. This film is no exception – the title is completely literal to the story of the film. But it’s b-movie material and so we don’t expect Corman to go much deeper than his literal title, but having seen Jack Arnold’s “The Incredible Shrinking Man” recently b-movie science fiction has room to expand our minds. “X” provides some existential thoughts about the responsibility of science (there are some things man was just never meant to see), but like a psychedelic trip, the film provides us pretty pictures for an hour and a half, without much of a hangover. Enjoy. read your social spark query in blogger help. IN PRAISE OF RICHARD FLEISCHER & "MANDINGO"